You will be asked to demonstrate that you can carry out the following basic machine checks. If you don’t know how to you will be shown. 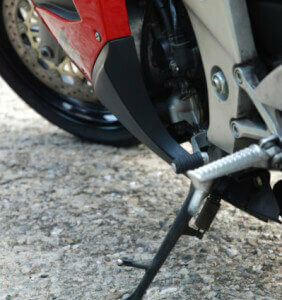 You will check for firm steering and no knocking as you apply the front brake and push down on the forks. You will turn the handlebars left and right to make sure there is no grinding or crunching. When you park a motorcycle you use a stand to support it. 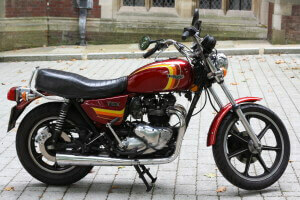 Motorcycles have either a centre or side stand, and many models are fitted with both. The centre stand gives more stable support than the side stand. It also supports the motorcycle so that maintenance can be carried out. The centre stand needs to be used on a firm level surface. Push the stand down with the right foot ( left foot, if preferred ) and hold the frame near the saddle with your right hand. Some machines have a special grab handle. WARNING – If the stand isn’t fully up it could dig into the road and cause an accident. The side stand is generally quicker and easier to use than the centre stand. It relies on the motorcycle leaning over onto the stand for stability. Slope of the ground doesn’t prevent the motorcycle leaning onto the stand. If the machine is too upright it will be unstable. WARNING – If the stand isn’t fully up it could dig into the road when you’re cornering and cause an accident. Some machines have an inhibitor switch which will automatically stop the engine if you try to ride off with the side stand down. You will be asked to walk while wheeling your motorcycle beside you on your right hand side. You will wheel it around to the left and right probably zig zagging in and out of cones. This is to show that you have proper balance. In wet or slippery conditions you need to apply a more equal pressure to both front and rear brakes. You’ll take much longer to stop when using only one brake. But at very low speeds, such as walking speed, using only the rear brake gives smoother control. To finish off Element B you will be asked to start the engine of the motorcycle you’re using and, after a few seconds, to stop it again. Some engines require a knack to make them start. The following is a general guide, but you may need to modify it to suit your machine. Your motorcycle is now ready to start. The next step depends on whether your machine has an electric starter or a kick starter. You have now completed Element B. Element C Here.